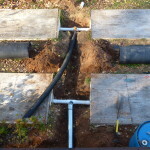 Welcome to the Worm Castings Page! 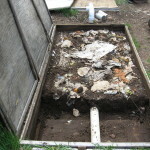 Worm castings, also know as vermicast or vermicompost, is the waste excrement of earthworms. 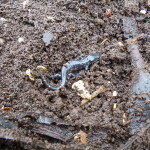 Worm castings make a great natural soil amendment and fertilizer. “Vermi” is a Latin word for worm, and is used an the words vermicast, vermicompost, and vermiproducts. 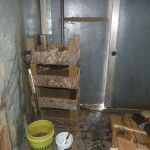 We have four wood heated 8x4ft bins that can hold in total 128,000 red worms and European night crawlers. Under perfect conditions the bins are calculated to be able to yield up to 11 tons of castings per year. That’s a lot of dirt to shovel!. 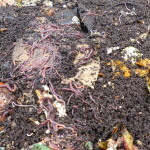 We feed our worms a mix of manure from local farms, organic waste, and cardboard. For large orders we can deliver castings in barrels to dump at your location, or you can also bring and fill your own container here! Lawns: 10lbs per 100 square feet. Vegetable/Fruit Gardens: 30 to 40 lbs per 100 square feet for large plants, and 20 to 30 lbs per 100 square feet for small plants. Perennials: 30lbs per 100 square feet. Potted Plants: 1/2 inch of worm castings every 4 months. 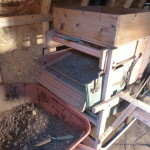 Seed starter mix: 1 part worm castings to 4 or 3 parts peat/other compost. Trees/bushes: In Spring, apply 1/4 to 1/2 inch of worm castings within drip line. 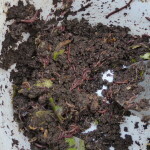 Red worms in a bucket. 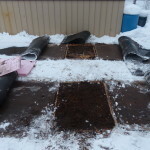 Cardboard and horse manure bedding. Kitchen scraps top off the bedding. 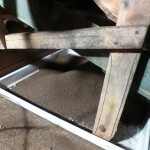 Drying worm castings in the kiln. Sifting debris from worm castings. Sifted worm castings are collected. 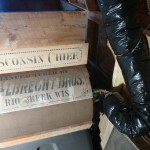 Kiln output and return ducts. 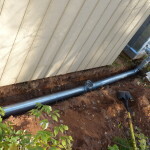 Burying worm farm heat duct. 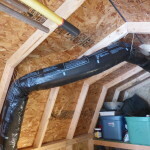 Heat duct from kiln through shed. 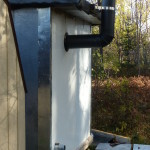 Heat duct connection to sifting mill. 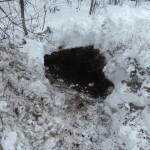 Horse manure pile insulated under snow. 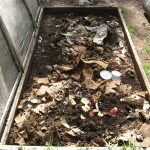 I would like to prebuy some vermicompost for next spring. 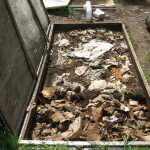 Please call me or e-mail me with cost of compost–I vermicompost myself, but I need more than I can produce for my home garden. 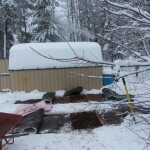 I have a trailer that I can P/U bulk compost and bring it home that will work with a skip loader or bucket.